I recently had the opportunity to read the Author's Release Copy of the middle-grade novel, Millicent Marie Is NOT My Name, and was completely charmed. 10/11/12 (cute!) is Millicent's official debut. To celebrate, join author Karen Pokras Toz on Thursday for a Twitter Party! Details below. So, Ladeez and Gentlemen! Without further ado, let's wish Millicent Marie a Happy Birthday!! 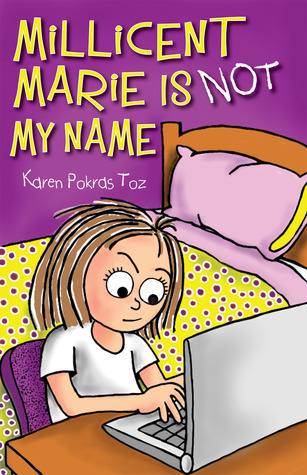 Thursday, October 11, is the day - the official launch of Millicent Marie is NOT my Name by Karen Pokras Toz! To kick things off you are invited to a Twitter Party. Join award winning children's author Karen Pokras Toz at 10 am, 11 am, and Noon EST and then again at 10 pm, 11 pm, and Midnight EST for 30 minutes of chatting, fun, and prizes. The easiest way to join the conversation is with tweetchat.com Login with your Twitter account, then enter #MillicentMarie to join the room. The Twitter Party is just the beginning of the fun. Karen will be on tour for the next 21 days. Check out the full schedule here. Summary: Twelve-year-old Millicent Marie does not like her name. After all, she was named for a woman who died more than fifty years ago and was not the most loveable member of the Harris family. Her friends call her Millie, but when she writes in her diary she refers to herself as Amanda – the name she always wished she had. When Millie’s younger brother finds her diary on her computer, he decides to publish it as a blog for the entire world to see, including the boy Millie has a crush on. In the midst of all the mayhem, Millie/Amanda discovers she is suddenly Springside Elementary’s most sought after sixth-grade mystery gossip and advice columnist. But not all is fun and games, as Millie quickly learns, once she realizes feelings are at stake. Nobody, least of all Millie, expects things to turn out as they do in this tale of friendship and respect. About Karen Pokras Toz: Karen Pokras Toz is a writer, wife and mom. Karen grew up in Connecticut and currently lives outside of Philadelphia with her husband and three children. In June 2011, Karen published her first middle grade children’s novel for 7-12 year olds called Nate Rocks the World, which won First Place for Children’s Chapter Books and the Grand Prize Overall in the 2012 Purple Dragonfly Book Awards, as well as placing first for a Global E-Book Award for Pre-Teen Literature. In 2012, Karen published the second in the Nate Rocks series, Nate Rocks the Boat, followed by middle grade novel, Millicent Marie Is Not My Name. Karen is a member of the Society of Children’s Book Writers & Illustrators (SCBWI). Follow the tour on Pinterest and don't forget to check out Millie's blog.